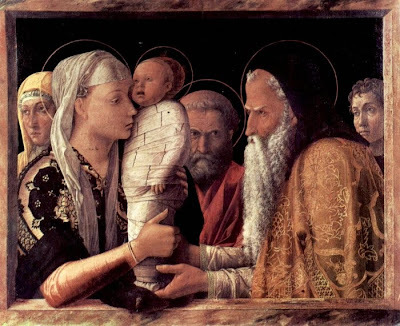 This evening, at this celebration of the Feast of the Presentation, or Candlemas, instead of a sermon, let me read TS Eliot’s poem, A Song for Simeon, based on the canticle Nunc Dimittis, and one of two poems written at the time of his conversion in 1927. This year marks the fiftieth anniversary of the death of TS Eliot, on 4 January 1965. Eliot titles his poem A Song for Simeon rather than A Song of Simeon, the English sub-title of the canticle in The Book of Common Prayer, and it is one of four poems Eliot published between 1927 and 1930 known as the Ariel Poems. In Journey of The Magi and A Song for Simeon, Eliot shows how he persisted on his spiritual pilgrimage. He was baptised and confirmed in the Church of England on 29 June 1927. Journey of the Magi was published two months later, and a few months later Faber published A Song for Simeon in August 1927. Both Journey of The Magi and A Song for Simeon draw on the journeys of Biblical characters concerned with the arrival of the Christ-child. Both poems deal with the past, with a significant epiphany event, with the future – as seen from the time of that event, and with a time beyond time – death. The narrator in Journey of the Magi is an old man, and in that poem, Eliot draws on a sermon from Christmas 1622 preached by the Caroline Divine, Bishop Lancelot Andrewes (1555-1626). A Song for Simeon is also put in the mouth of an old man, the prophet Simeon in the Temple in Jerusalem. Here too, Eliot draws on a Christmas sermon by Andrewes. In both poems, Eliot uses significant images to explore the Christian faith, images that are also prophetic, telling of things to happen to the Christ Child in the future. In both of these poems, he focuses on an event that brings about the end of an old order and the beginning of a new one. Canon Patrick Comerford is Lecturer in Anglicanism, Liturgy and Church History, the Church of Ireland Theological Institute. This address was delivered at the Candlemas Eucharist on 2 February 2015. A podcast of this address is available here.